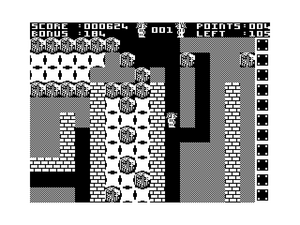 Stone Raider II is a game heavily inspired by the Boulder Dash series of games. You score points and get to the next level by picking up a number of diamonds and then locating the exit before the timer runs out. Beware of falling boulders, monsters roaming your tunnels, the dreaded slime and other obstacles. There are 25 different levels, and each presents a different set of challenges to strategic thinking, problem solving and fast coordination. 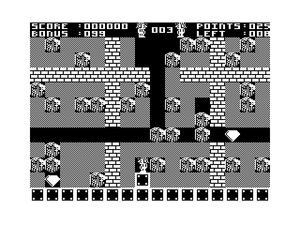 The game supports joystick operation only and only supports black and white graphics. 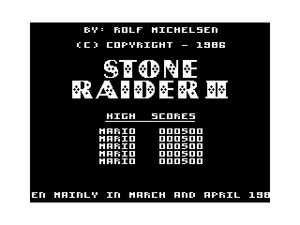 There is a cheat mode that can be activated by pressing the letters "STONE" while on the title screen. The cheat mode allows you to set the starting level, the number of lives and the bonus timeout speed. 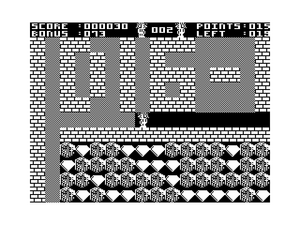 The original title of the game was Dig-it. 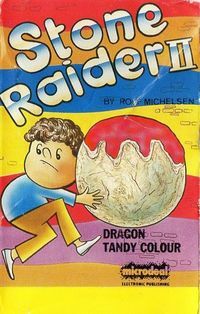 The original name occurs in level 4. The assembler source code for this game has been released under a BSD license and is available for download from the developer's site. This page was last modified on 28 April 2018, at 12:10.